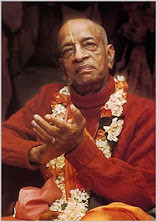 Srila Gaura-kisora dasa Babaji Maharaj is the spiritual master of Bhaktisiddhanta Sarasvati Thakura. He was born in a vaisya family in a small village beside Padma River in Bangladesh. Following his father, he earned his livelihood by selling grains. He was devotionally inclined from childhood and spent many hours singing bhajans and hearing Krishna-katha. He was married very young but when his wife died in 1849, he immediately left home and went to Vrindavan. For the next 30 years he lived in Vrindavan wandering around the forests and pastime places of Srimati Radharani and Lord Sri Krishna while absorbed in chanting Holy Names: HARE KRISHNA HARE KRISHNA KRISHNA KRISHNA HARE HARE/ HARE RAMA HARE RAMA RAMA RAMA HARE HARE. He would lie prostrate, offering his humble obeisances to the residents of Vraja, considering them as embodiments of Lord Krishna. During this time he took babaji initiation from Bhagavata dasa, a disciple of Srila Jagannatha dasa Babaji Maharaj. Gaura-kisora dasa Babaji Maharaj was a renunciation personified. He chanted 200,000 names of Lord each day and stayed in isolated places, eating only what would come of its own accord and sleeping wherever he found himself at night time. He had very few possessions: Tulasi-mala (Tulasi beads) around his neck; another Tulasi-mala on which he chanted; and a few books such as Narottama Dasa Thakura's Prarthana and Prema Bhakti Chandrika. He refused service from anyone and would not let anyone serve him, though many tried. In 1894, he heard that Lord Caitanya’s birthplace has been discovered and so he came to Navadvipa-Mayapur Dhama, knowing the two Dhamas are non-different. In Navadvipa-Mayapur, he again wandered around the places of the Lord’s pastimes absorbed in ecstasy of separation. His renunciation was intense and genuine. He would dress himself in the discarded cloth used to dress corpses, beg rice from householders, and cook with discarded earthen pots. He would dance on the banks of the Ganges chanting the Holy Names of Krishna; at other times he would lie on the ground unconscious. Others tried to imitate Gaura-kisora dasa Babaji’s renunciation wanting to gain fame for themselves, but they all fell away into disgrace. In 1908 Gaura Kisora Dasa Babaji Maharaja lost his sight. He refused attempts to take him to an eye specialist, preferring instead to chant and worship Lord Krishna. He stopped travelling at this point. He would sit in his bhajana-kutir deeply absorbed in Krishna's pastimes. Babaji Maharaj encountered many disturbances to his Hari-bhajana from the materialists who sought benedictions from him. They all received heavy instructions from Babaji Maharaj, but very few were able to understand that these instructions were actually for their eternal benefit. One time Babaji Maharaj arrived at the house of Srila Bhaktivinoda Thakura dressed in very expensive clothes. When asked about this, he explained people would think he is bogus and so not come to him for benedictions. At other times he sat on the porch of a prostitute’s house to avoid people, and lived under an upturned boat hoping no one would find him there. During the last 6 months of his life, he resided in an abandoned latrine (converted into a room) in a dharmasala to avoid the materialists and concentrate on chanting the Holy Names: HARE KRISHNA HARE KRISHNA KRISHNA KRISHNA HARE HARE / HARE RAMA HARE RAMA RAMA RAMA HARE HARE. He left this world at this dharmasala on 19 November 1915 on Utthana Ekadasi, at the end of the Kartika vrata. On 19 Nov 1915, on Utthana Ekadasi in the Kartika-vrata, Srila Gaurakisora dasa Babaji Maharaja re-entered into his eternal loving pastimes with the Supreme Lord Sri Krishna. After Srila Bhaktisiddhanta Sarasvati Maharaja had heard of his disappearance, he went to the place where Srila Gaura-kisora lived. At that time different persons from different temples in the area began to fiercely argued to claim the spiritual body of Srila Babaji Maharaja. But Srila Bhaktisiddhanta Sarasvati Maharaja obstructed them from doing so. The inspector of the police of Navadvipa arrived at the scene. Srila Bhaktisiddhanta Thakura replied, "I have faith in their word". At this, one-by-one all the bogus babajis slipped away without a word. Srila Bhaktisiddhanta Sarasvati then claimed the samadhi. After this, several persons approached Srila Bhaktisiddhanta Sarasvati Maharaja and said, "Before Srila Gaura-kisora disappeared, he requested that his body be bound with ropes and be dragged through the streets of Navadvipa Dhama, and thus, be bathed in the dust of the Dhama. Therefore, we should follow these instructions of Srila Babaji Maharaja." Then Srila Bhaktisiddhanta Sarasvati Maharaja spoke up and said, "My spiritual master, on whose shoulders reside the Supreme Lord Krishnacandra, has said this in a very, very deep mood of humility in order to destroy the pride of those persons who are opposing the Supreme Lord. Even though we are inexperienced, foolish and offensive, still, I will not let his instruction be misinterpreted. Sri Caitanya Mahaprabhu took the spiritual body of Srila Haridasa Thakura, when he disappeared, on His lap and began to dance. Just see how his glories have been described. So therefore, we are also following in the footsteps of Lord Caitanya. Place the transcendental body of Srila Gaura-kisora above our heads." According to the regulations from the Samakara Dipika, Srila Bhaktisiddhanta Sarasvati Maharaja with his own hands prepared the samadhi of his spiritual master. 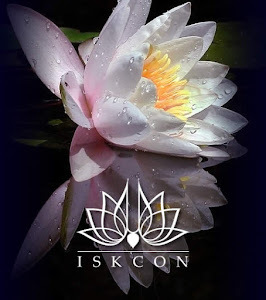 Later on, by the desire of Srila Gaura-kisora dasa Babaji Maharaja, the place of his samadhi gradually became engulfed by the changing current of the Ganga. When the samadhi was within very close proximity to Ganga Devi, in 1932, his samadhi was moved under the instructions of Srila Bhaktisiddhanta Sarasvati Maharaja, from that place to a place in Sri Mayapur Dhama where the Caitanya Math is presently situated. #1) Srila Gaura-kisora dasa Babaji Maharaj’s Samadhi is at Sri Caitanya Math on Bhaktisiddhanta Sarasvati Marg, which is about 3kms from ISKCON Sri Mayapur Candrodaya Temple or ½ km from Srivasa Angan (the house of Srivasa Pandita). #2) Sri Caitanya Math is a stopover during “Navadvipa-Mandala Parikrama” which is organized every year about 2 weeks before Guara-Purnima Festival at Sridham Mayapur. One can visit this transcendental place by attending Navadvipa-Mandala Parikrama.